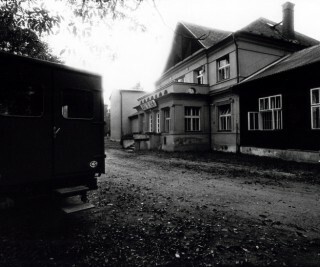 Drak Theatre was founded in 1958, in Hradec Králové, Eastern Bohemia. Its initial period is connected with the author and director Jiří Středa and the visual artist František Vítek. The second phase enriched the creative team by the artistic director and dramaturg Jan Dvořák, the director Miroslav Vildman, the visual artist Pavel Kalfus and Jiří Vyšohlíd, musician and actor. Their production “Pohádky z kufru” (Fairy tales from the Suitcase) became a sensation at the international festival UNIMA in 1966. This performance paved the way for still lasting national as well as international popularity of Drak theatre. In 1971, Josef Krofta, a young director joins Drak. His debut performance is “Princezna s ozvěnou” (Princess with Echo) /1971/. His famous production “Enšpígl” (Eulenspiegel) has an unforgettable scene design by František Vítek. When theatre is joined by Petr Matásek, the legendary creative trio Krofta – Matásek – Vyšohlíd is formed. Their collaboration makes Drak one of the most important puppet stages even in international context. Their productions “Šípková Růženka” (Sleeping Beauty), “Popelka” (Cinderella), “Jak se Petruška ženil”(How Petrushka Was Getting Married), “Zlatovláska”(Goldilocks), “Cirkus Unikum dnes naposled” (Circus Unikum Today Last Time), “Kalevala,” “Sen noci svatojánské”(Midsummer Night’s Dream) or “Pinokio” (Pinoccio) became significantly inspired for international puppetry and are cited and described in many professional articles even nowadays. In 1995 Drak is joined by Josef Krofta’s son, the director Jakub Krofta, as wella s with the stagedesigner Marek Zákostelecký. Their original productions combine elements of puppet, clown, visual and musical theatre (“Všechno lítá co peří má” or “Hopla! Kukla pukla!”). The dramaturgy of the theatre is extended by new productions for young adults – “Tajný deník Adriana Molea” (The Secret Diary of Adrian Mole) or “Alenka zamilovaná” (Alice in Love). At the same time the troupe is also siginificantly changed. Drak in the cooperation with Klicpera Theatre become the organizers of the greatest theatre festival in central Europe called Theatre European Regions. In 2010 Drak theatre is expanded with a new venue called Drak Theatre’s Labyrint, which was created due to extensive reconstructions of adjoining Terezian barracks. Thus new unique venues were created – so called theatre laboratory, exhibition space and adjustable theatre box for one hundred spectators. Jana Dražďáková, theatre’s long-lasting directing manager retires in 2010. Eliška Finková becomes the new directing manager and together with the dramaturg Dominika Špalková they start another gradual transformation of the theatre. Besides the opening of Labyrint they expand theatre’s activities by educational programmes for children and their teachers; they also initiate a long-lasting cooperation with DAMU, Prague, within the project Gaudeamus Theatrum. Simultaneously, after a long time Drak opens to visiting directors to create productions such as “Děvčátko se sirkami” (Girl with Matches, directed by Matija Solce), “U kanónu stál” (by Tomáš Dvořák), “O štěstí a neštěstí” (by Ondrej Spišák) or “Ikaros” (by Jakub Vašíček). By far the most successful production, “Poslední trik Georgese Mélièse” (The Last Trick of George Méliès), directed by Jiří Havelka, received numerous prestigious awards and has been invited to many international festivals worldwide. In September 2014 Dominka Špalková becomes the artistic director and the theatre is joined by another permanent director Jakub Vašíček and the dramaturg Tomáš Jarkovský. Their first season’s premiere is their production “Amundsen kontra Scott” (Amundsen vs. Scott), an adventure story of a dream quest. It is followed by “A do třetice…,” a performance for the youngest audience. In March premieres a unique five-week project called “The Labyrinth of the World and the Paradise of the Heart” by the creative trio Dominika Špalková – Ondrej Spišák – Tomáš Žižka. The interactive production completely transforms the original venue of Drak theatre as well as the Labyrint building for the period of five weeks. The production was devised in the collaboration of almost 50 people and its concept was prepared for two years. The production was positively received both by public and critics. 23 repetitions of the production were seen by over 2000 spectators including pupils, students as well as the public. The added value for the spectators in the role of pilgrims was to discover the hidden corners of the theatre, which are otherwise inaccessible. Each spectator could have chosen their own way and thus experience a different story. This concept led the spectators to activity and consequent sharing of their experience with other participants. The impetus for this “production,” based on J. A. Comenius’ The Labyrinth of the World and the Paradise of the Heart, was the intention to re-establish the International Institute of Figurative Theatre, founded in 1993 in Drak Theatre by Josef Krofta. The crucial impulse was the need to explore new content and form of the permanent exhibition of Drak Theatre’s Labyrint, opened simultaneously with the new Labyrint building in 2010. Equally important was to discover new “connection with the old building” of Drak Theatre and join both venues via meaningful artistic activity. The project resulted in the development of the Institute with its continuous, activities and also ignited the need of further interconnection and fusion between theatre and education. Additionally, a new gallery space hosting art exhibitions was created in Labyrint. The relationship between spectators-visitors and Drak theatre became more intense due to the possibility to experience theatre from inside not only physically but also mentally. The event sparked interest in cultural life among local citizens. Drak Theatre introduces the fourth premiere this season, the production called Princezna Turandot (Princess Turandot) based on an Old Persian tale and the play by Carlo Gozzi. The production will premiere at Theatre European Regions. Dušan Hřebíček leaves the ensemble at the end of the season. Drak Theatre further develops international cooperation (participation on the EPKE, international project supported by EU Culure grant); regular interactive education programmes for schools are held; it also accredits educational seminar for teachers Jak se dívat na divadlo (How to watch theatre). To commemorate the 60th anniversary of its existence Drak Theatre opens a series of tribute events called Fenomén Drak (Drak Phenomenon). The season of 2014/2015 was marked by three mournful events. The former actress Libuše Bogostová succumbed to a serious illness in August. Jaroslav Hodousek, the long-term stage manager died in March and just three days later was followed by an exceptional personality, great theatre-maker and the artistic director of Drak Theatre, prof. Josef Krofta. Honoured be their memory! 2015/2016 Season opens with a new premiere Čert a Bára by the visiting director Jiří Jelínek. Another premiere follows in January – O dvanácti měsíčkách. The list of premieres of the season is completed by the production O bílé lani, based in classical fairy-tale motifs, poetry of Jan Skácel musicalized by Jiří Vyšohlíd. The annual award of Theatre Newspaper for “Poslední trik Georgese Mélièse” (The Last Trick of George Méliès) – Dušan Hřebíček for best leading role acting performance of the season regardless category, Jiří Havelka and Marek Zákostelecký in category Puppet and visual theatre. Jiří Vyšohlíd, the long-term member of Drak Theatre, actor, director and composer, was awarded Thálie Award for lifelong achievement in puppet theatre. The production “The Labyrinth of the World and the Paradise of the Heart” was nominated for Hradecká múza – the annual award of Hradec Králové town for significant achievements in culture. Stretnutie, Setkání, Spotkanie, Talalkozás (SK), LUTKE (SLO), Bábkarská Bystrica (SK), International Festival of Puppet Theatre Spotkanie (PL), CIKL-CAKL (AUT), Bliscy Nieznajomi (PL), Bábková Žilina (SK), Liudui Hakka Children’s Arts Festival (TWN), Miasto Ogrodów (PL), Visioni di Futuro (IT), MUKAMAS (FIN), Teatr lalek Baniluka (PL), La Coruna Niňas y Niňos (ESP), APAP New York (USA), Mezinárodní festival Osthafen (DE), Assitej World Congress of Theatres for Children and Young People (PL), Tallin Treff Festival (EEK), Place and Form Festival (PL), Puppet Fair (BGR), Festival Teatralia (ES), Showcase of the New Teatr efor Children (PL), The Train Theatre – The International Festival of Puppet Theater (ISR), Festival of Wonder (DNK), Festival KUKLA (TUR).